The bead stitch has to be one of my new favorite stitches. It is like a puff stitch but worked sideways by working around a double crochet instead of into the stitches of the previous row. This stitch is very easy to learn and has such a unique look. Below you will find both a video and photo tutorial to walk you through this stitch. I think you will find it an easy stitch to master. Gauge is determined by using the Bead Stitch. The Bead Stitch has the width of two stitches. Bead Stitches are worked around the Post of a Double Crochet. To work a Bead stitch you will need an even number starting chain. Bead Stitch – Dc in the next st, *Yarn Over, Working around the Double Crochet post just made pull up a loop* repeat from *to* for a total of 3 times, Yarn Over and pull the first loop through the next 6 loops on the hook, (this will leave 2 loops on the hook), Yarn Over and pull through the 2 loops on the hook. Because the Bead Stitch has the width of two stitches, you will skip a stitch before working your next bead stitch. When working Bead Stitch you will want to Chain a multiple of 2 for your starting chain. Large 12 inch Swatch we will chain 41. Medium 8 inch Swatch we will chain 27. Small 4 inch swatch we will chain 13. Ch 13, 27, or 41 depending on the size swatch you are making. R2: Ch2, turn, Dc in the first St, *Bead St, Skst,* repeat until the last St. Dc in the last St.
R3: Ch1, turn, Sc in each St across. Repeat Rows 2 and 3 until your swatch is as large as you would like it to be. For the 12 inch square work until you have a total of 27 rows. To make a 8 inch square work until you have a total of 19 rows. For the 4 inch square work until you have a total of 9 rows. 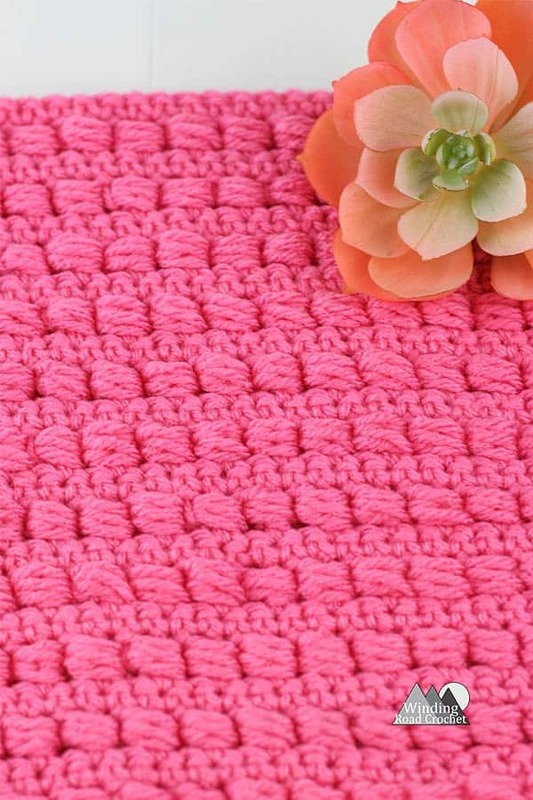 A Single crochet border makes your edges loop nice and is recommended if you are making any of the March Texture Madness projects. Ch1, working down the side of the rows, Sc into the side of each Sc row, and 2 Sc in the side of each Bead Stitch Row, Ch1, turn at the corner, Sc in the bottom of each St across, Ch1, turn at the corner, working down the side of the rows, Sc into the side of each Sc row, and 2 Sc in the side of each Bead Stitch Row, Ch1 , turn at the corner, Sc in the top of each St. Ch1 slip stitch to the first Sc of the border row. Written pattern, tutorials, graphs and pdfs for the Bead stitch tutorial are copyright Windingroadcrochet.com. Please do not reprint or repost this content as your own, but please feel free to share this link with others. You can find more information on sharing my work with others in the Terms and Conditions Page.